(Nanowerk News) Whether driving a car with a lean burn engine or a conventional one, your catalytic converter struggles to reduce emissions in the first 30 seconds after you start the car. Your platinum-based converter does not work well in colder temperatures, before the engine warms up. Isolated palladium atoms on γ-alumina supports along with a small amount of lanthanum oxide can efficiently turn carbon monoxide into carbon dioxide at 40 degrees Celsius, potentially reducing toxins emitted by vehicle exhaust and replacing or reducing the need for platinum in catalytic converters. Scientists including two at Pacific Northwest National Laboratory discovered that isolated palladium atoms could reduce emissions under these conditions. They showed that the palladium atoms efficiently turn carbon monoxide into carbon dioxide at 40 degrees Celsius. The multi-year study appears in Nature Communications ("Low-temperature carbon monoxide oxidation catalysed by regenerable atomically dispersed palladium on alumina"). Catalytic converters, first seen in the U.S. automotive market in the mid-1970s, use platinum to reduce the toxins emitted. For scientists and automotive manufacturers, the challenge is to use less platinum or a more readily available metal. Catalysis by single isolated atoms would reduce the amount of metal needed and would be more efficient. This study shows that isolated palladium atoms on γ-alumina supports along with a small amount of lanthanum oxide can get the job done. The researchers conducted experiments and performed density functional theory calculations to understand the activity of palladium atoms on γ-alumina supports. The team used operando X-ray absorption spectroscopy and aberration-corrected scanning transmission electron microscopy. At Pacific Northwest National Laboratory's Institute for Integrated Catalysis, Dr. Ja Hun Kwak (now a professor at Ulsan National Institute of Science and Technology (UNIST) in South Korea) and Dr. Charles Peden prepared parallel sets of samples of palladium/alumina and lanthanum/alumina to confirm the presence of intermingled palladium and lanthanum on the γ-alumina surface. 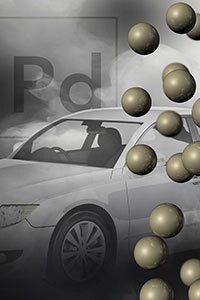 At the Institute for Integrated Catalysis at PNNL and elsewhere, research continues into designing catalysts that will remove pollutants from vehicle exhaust emissions operating at or below the DOE target of 150 degrees Celsius or about 300 degrees Fahrenheit.